Whenever the credits roll on a new Resident Evil game, I've never wondered if the game could have been improved with a few more puzzles. Resident Evil puzzles are a strange beast, and the third episode of Resident Evil: Revelations 2 is full of them. Ready to move crates? 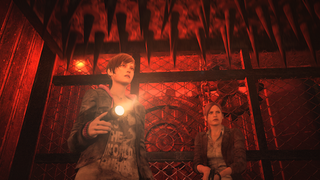 My decision to write about every episode of Resident Evil: Revelations 2 gave me serious pause when the first episode wasn't very good, but the second episode was much stronger. There was hope! Even if the story was totally out there, the game was finding footing in demanding more from players during combat and establishing a dynamic contrast between Barry and Natalia. Sadly, the third episode is a rollercoaster of emotions, a mixture of the best and worst moments of Revelations 2 so far. And as I've already alluded to, much of it has to do with Capcom deciding this was the time to slow the game's pace down with cryptic, albeit easy, puzzles. As a refresher, we left our two groups of island explorers in similar places, albeit different times. Claire and Moire finally reached the tower at the center of the island, a place the two assumed would hold answers about their kidnapping, the strange bracelets on their wrists, and the general weirdness around them. The two were escorting Natalia by the end, but in the middle of a serious firefight, Natalia was whisked away by an unknown entity. In the future, Barry and Natalia have climbed the tower and come face-to-face with Albert Wesker's sister, who apparently injected herself with the virus she's been cooking up and it's made her...really gross. For reasons still unknown, Natalia is very important to Wesker and her plans for the world. Given that one of my favorite games of the past few years is Fez and I recently spent hours digging through The Talos Principle, I don't have a problem with puzzles. I don't even have a problem with Resident Evil's brand of obtuse puzzles, which generally involve swapping gems and eyeballs and other nonsense. But Revelations 2 found its groove when it was constantly pushing forward, asking players to find resourceful and inventive ways of surviving combat. There's a good chunk of that in this episode, as well, but it's stymied by the endless puzzles. I'll give Revelations 2 some credit, though. At least it's a little inventive and self-aware. Mild spoiler ahead. One of the puzzles takes place in a meat factory. You're after a stone liver to place inside a stone statue because of course you are. The liver is locked inside a seemingly unbreakable box, but above the box are a series of hooks. A nearby button moves the hooks along, dangling a hunks of meat over it. If you shoot the hook, the meat will fall down, get ground up into bloody chunks, and begin to fill the box. Once the box is full, the liver is yours. Not bad. Not all of the puzzles are that clever, however, and the big issue is their abundance. Puzzles are an opportunity for players to slow down and catch their breath, but when the fourth one shows up, it feels like the game stalling for time in an episode that doesn't need it. I'm also tiring on the formulaic structure to the episodes. Not matter how careful you've been with your shots over the course of the episode, you can always count on a boss requiring almost everything you've got at the very end. Capcom seems to feel each half of the episode needs to end in a massive firefight with a new, grotesque creature. I could buy into the idea if the encounters were always interesting, but now, I'm even sighing when the sequence begins. As has been the case with previous episode, this is where I pivot to Natalia and Barry's section and remark at how much more I enjoyed playing as the two of them. Once again, the action and puzzles are better suited the differences between the characters. Most memorably, Natalia finds herself above Barry and opening doors for him. Whenever there are enemies around, usually Barry and Natalia are side-by-side. Here, Natalia is on her own, and while she's capable of defending herself with a brick, it's no replacement for a rifle. You end up using Natalia as bait, luring enemies over, switching to Barry, and taking out the enemy. It feels really good, reinforces how complementary the characters are to one another, and avoids making the introduction of two characters feel forced and unnecessary for anyone playing the game alone. The most emotional story beats are between these two, as well. When we join up with Natalia and Barry, the game provides us a brief moment of calm between the two. Exhausted, Natalia hops on Barry's back and the two talk about why Moira and Barry's strained relationship hasn't improved over the years. We also learn why Moira, despite being on an island full of deadly creatures, refuses to pick up a gun. It's a touching and humanizing moment for both of them. By and large, I really enjoyed the third episode. The puzzles were draining, but the story might actually be headed to some interesting places with Natalia, Barry's becoming a real character, and as my skill tree expands, combat continues to gain additional nuance. We're in the home stretch of the main story, too, with the final episode dropping next week. I'll see you all then!